Nootropic stacks are designed to bring out the potential effects of compounds and dietary supplements that may work together. One of the most popular stacks is a simple combination of L-theanine and caffeine. Let’s take a look at these two compounds and learn the potential effects they may have when they work synergistically. As the key ingredient in coffee and tea, caffeine is most notable for potentially encouraging increased energy. The main mechanism of action for caffeine involves its role as an adenosine antagonist. Adenosine is a compound found in your body that causes drowsiness, relaxation, and a sense of calm when it activates its receptors in the brain, essentially ensuring that your brain does not become over-excited. There are four adenosine receptor subtypes (A 1, A2A, A2B, and A3), and caffeine is an antagonist at all four subtypes. Antagonism of the A2A receptor is the primary mechanism for caffeine's wakefulness-promoting effects, and is also the subreceptor that caffeine has the highest affinity for. The A2A receptor is also an important regulator of glutamate and dopamine release. They are predominantly expressed in enkephalin-expressing GABAergic striatopallidal neurons, and tightly interact structurally and functionally with dopamine D2 receptors. This makes them a crucial target for supporting sleep, motivation, reward, pain, and physical performance. Caffeine mimics adenosine, but acts in reverse to prevent adenosine from reaching its receptors. This results in the sense of wakefulness and physical and mental alertness that many coffee-drinkers experience. Inhibiting adenosine may also affect the systems involved in adrenaline, dopamine, serotonin, and acetylcholine, which contributes to many of caffeine’s potential nootropic effects. Some studies show that caffeine may also improve memory, enhance concentration, and promote general cognition. Caffeine also metabolizes into a number of different compounds, all of which have their own unique effects on the body. The highest percentage metabolite is paraxanthine. Paraxanthine, or 1,7-dimethylxanthine, is not produced by any plant, and only exists in nature as a metabolite. Roughly 84% of a caffeine dose is metabolized into paraxanthine in a process called demethylation. It possesses equal potency to caffeine, and has a number of unique beneficial effects. Paraxanthine is a competitive nonselective phosphodiestearase inhibitor, which increases cAMP levels, activates protein kinase A, and inhibits TNF-alpha and leukotriene synthesis. Paraxanthine, unlike caffeine, results in increased transport of potassium and calcium ions in skeletal muscles, through acting as an enzymatic effector of Na +/K+ ATPase. The second highest percentage metabolite of caffine is theobromine. It is an alkaloid that is also found in chocolate, tea leaves and the kola nut. It is also created by demethylation of caffeine, but at a different position on the structure. Theobromine is then metabolized to xanthine. It is also a PDE inhibitor, and has very similar effects to paraxanthine. The third metabolite of caffeine is theophylline, or 1,3-dimethylxanthine. It is found in large amounts in tea leaves and cocoa. So not only do the direct effects of caffeine come into play, but its metabolites are responsible for many of the varied effects that people receive after consuming caffeine. This includes some of the side effects. This is where L-theanine can be useful. L-theanine, also known as L-γ-glutamylethylamide and N5-ethyl-L-glutamine, is an amino acid that is most commonly found in certain mushrooms and tea leaves. Theanine has a similar structure to glutamine and glutamate. It exists naturally in the levorotory form, which is why it is often denoted with an L before the name. Synthetic theanine can be made enantiopure, or more cheaply in racemic form; which is a mixture of D and L forms. Thus, properly testing the optical rotation using a polarimeter is key to ensure receiving the most effective form. Theanine has been shown to react with neuroreceptors, particularly increasing the production of GABA. GABA has various function in the body, but it is best known for managing stress messages and generating alpha waves. Alpha waves are electrical impulses in your brain that have been found to accompany states of physical calm and relaxation without feeling heavy or listless. Other studies have found that alpha waves may even boost creativity and reduce symptoms of depression. L-theanine binds to ionotropic glutamate receptors, including the kainate and AMPA as antagonists, and NMDA receptors as an agonist. It also binds to group 1 metabotropic glutamate receptors, which are involved in learning and memory. Unlike ionotropic receptors, metabotropic glutamate receptors are not ion channels, but instead control the activation of biochemical cascades, leading to the modification of other downstream proteins and ion channels. This mechanism leads to changes in synaptic excitability, or even induction of postsynaptic responses. Research shows that L-theanine may improve mental focus and attention as well as sharpen the senses. Theanine may also promote healthy stress levels. In addition, studies have shown that L-theanine supplementation can extend the lifespan of C. Elegans by an average of 3.6%, and a maximal value of 4.4%. More studies are needed to assess if this longevity effect translates to humans, but the effect is very promising. Human studies have also shown that L-theanine supplementation, paired with green tea extract, improved delayed recognition time and immediate recall scores. How Does L-Theanine and Caffeine Work Together? As effective as caffeine can be, it can come with some drawbacks. Taking too much caffeine can easily lead to jitters, and a characteristic crash once the caffeine has worn off. Mismanaging your caffeine can also cause sleep issues, and lead to a tolerance to the compound, forcing you to take more of it to sustain similar effects. That’s where L-theanine comes in. When taken together, L-theanine can take the edge off of caffeine. The potential inhibitory nature and calming effects of theanine can nullify the jittery muscles, hyperactivity, and restlessness that may come with taking too much caffeine. 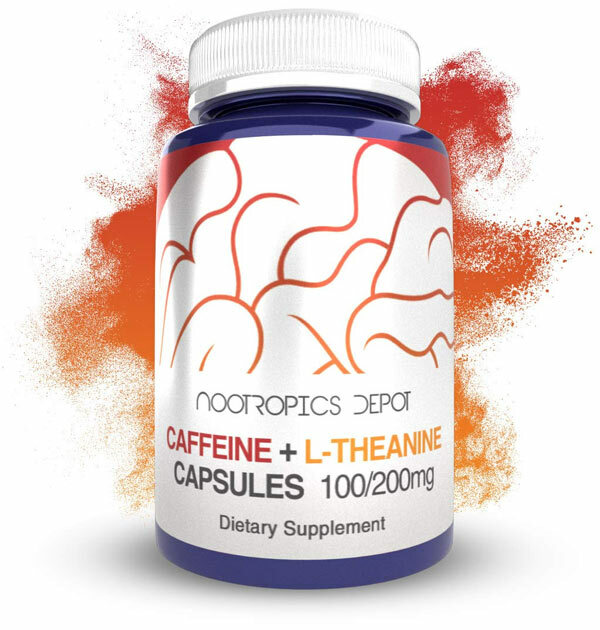 Since L-theanine can increase dopamine, GABA, and glycine levels in the brain, and may inhibit glutamate excitotoxicicty, it is ideal for balancing out the unwanted side effects of caffeine. More importantly, combining theanine and caffeine may also increase the potential benefits of both compounds. They act synergistically together to improve the beneficial effects of both compounds. Studies have shown that caffeine alone improves accuracy on attention-switching tasks, but that the combination of both caffeine and L-theanine improved both the speed and accuracy of performance at the same tasks, and reduced susceptibility to distracting information during memory tasks. While L-theanine and caffeine have beneficial effects on their own, multiple studies show that the combination of both to offer significantly improved effects. 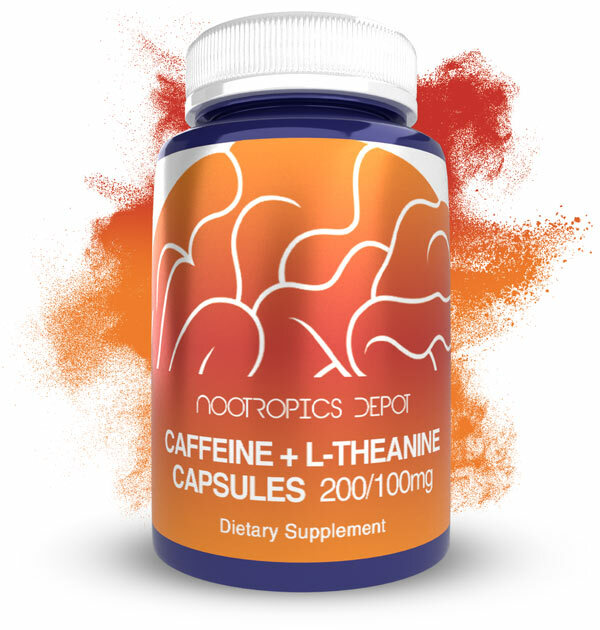 If you would like to try this stack yourself, Nootropics Depot offers caffeine and L-theanine capsules that have been carefully measured out to get the most out of the combination. Already have a caffeine source? Consider our L-Theanine capsules as well.